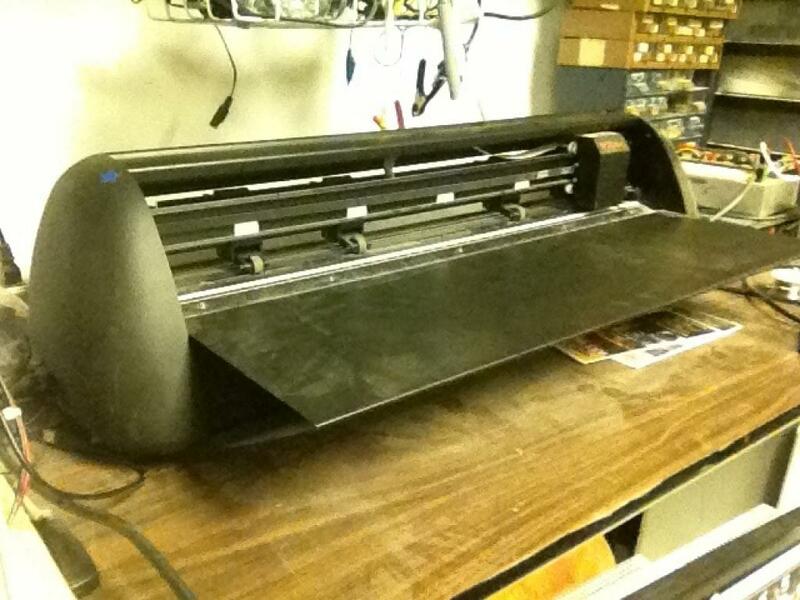 This is an Eagle ACS 24" vinyl cutter, bought from Quilling Patch (http://www.canada.quillingpatchstore.com). It is made by KNK. This is a brief set of instructions to use the vinyl cutter. I followed these steps successfully tonight. Have your .svg file on hand. You may want to speak to Simon Clark or Jamie Mckeown about setting up a DropBox account to access your file. It's an easy and convenient way to have files available for any computer connected to the internet. Get the vinyl cutter ready. You will notice some toggles at the rear of the bar crossing the top of the machine (we will call this the carriage). Those toggles need to be above the control wheels in the bed of the machine. To see this, remove any vinyl on the bed by flipping the toggles up to free the vinyl. Check to see if the wheels from the toggles are centred on the wheels on the bed. If they are not, move them. To load the vinyl, have the toggles up, and feed it into the space between the carrriage and the bed. Make sure that there is about a foot and a half of vinyl behind the carriage. The machine will advance about that much vinyl at the start of the cutting procedure. Lower the toggles into the vinyl. The cutting blade has to be checked as well. A lot of the time it has been retracted to protect the blade. The blade cartridge is at the far right of the carriage. Unscrew the cartridge using the knurled button at the front. The cartridge looks a bit like a bullet with a hole in the nose. If there is no blade sticking out just barely, twist the top until it just peeks out. Replace it into the front of the carriage. Once that's all done, go to the Programs menu on the computer. Look for "Make the Cut! " on the menu and open the program. Import your .svg file. It should drop into the screen. In the menu bar, click "Cut project with..." and it should show you that "Klick-N-Kut Zing" has been checked. Click ok, and the machine should cut your work. Keep the knife very close to the edge of its opening. This item was bought with money from The Trillium Grant.